Take a journey to the past that’s loaded with plenty of modern fun in Northern Indiana Amish Country. Get a true look at the Amish lifestyle and learn about their history in the third largest Amish area in the nation. Tour country roads traveled more by buggies than cars. Stop at shops filled with goods your grandma probably used. Savor hearty Amish style fare. Meet Amish business owners who make the products and craft the wares for their culture. Delight in scenic backroads, peaceful people and local products that make Amish Country so memorable. Laugh, sing and be entertained in local theatres on family-friendly entertainment and Broadway musicals. You’ll be busy all the time and loving every minute! The Shipshewana Flea Market is a not-to-be-missed Hoosier tradition with nearly 900 booths in an open-air market covering 100 acres. The vendors are open 8 a.m. to 5 p.m. every Tuesday and Wednesday, May through September. It’s also open Memorial Day, 4th of July and Labor Day. Vendors offer a variety of products and truly have something for everyone: quirky novelties, fresh seasonal produce, crafts, home decor, dollar items, clothes, garden supplies, cleaning supplies, beauty essentials, paper goods, jewelry, snacks, accessories, games, books, toys, furniture, baked goods, signs, silk flowers, t-shirts, pet supplies and everything in between. Open rain or shine. There are food courts, a sit-down restaurant and rest areas throughout the market. The antique auction barn, open Wednesdays year-round, has up to 10 rings simultaneously auctioning antiques and collectibles. The livestock barn features cattle auctions open to the public on Wednesdays and horse auctions open to the public on Fridays. Guests can also stroll into downtown Shipshewana to browse over 90 retail stores for additional shopping. 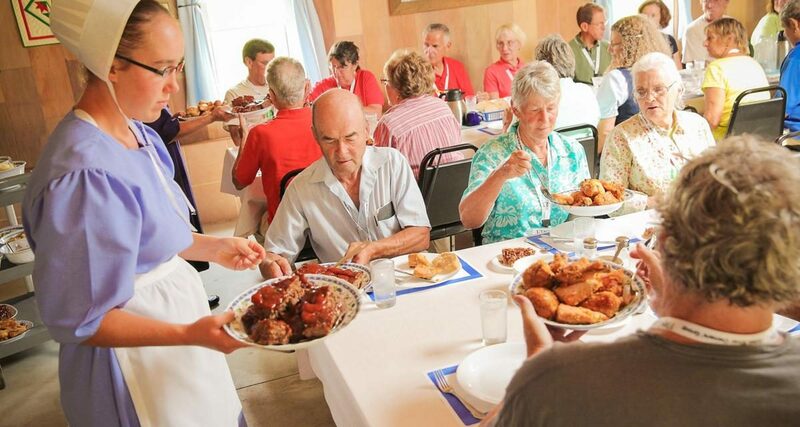 Later, enjoy Amish Acres’ famous family-style Threshers Dinner in the century-old barn restaurant. Start your dining experience with thick ham ‘n bean soup served from cast iron kettles, baskets of homemade Hearth bread, sweet & sour cabbage salad and sweet & sour pickles. Then pass around heaping platters filled to the brim with your choice of two farm-fresh meats served with brimming bowls of beefy egg noodles, fluffy mashed potatoes, flavorful sage dressing and giblet gravy. Top it all off with tins of fresh baked pies and hot coffee. Your evening continues in the majestic 1911 Round Barn Theatre with a Broadway musical production on the Joseph Stein Stage. This professional theatre company offers a variety of shows in repertoire with both matinee and evening performances. Choose from nine show times most weeks to fit in your itinerary. Have you ever wondered what it’s like to run a household without electricity or live without owning a car? Hear the story of the Amish from the Amish themselves. Start off your day with a cinnamon roll and learn how Elaine makes this delectable pastry. You’ll visit a buggy maker then shop in Slab Town. See baskets made by a family of weavers and take home a gift to remember them by. Enjoy a popular Amish fundraiser meal, the Haystack, for lunch. Then go back to school—one room that is—to visit an Amish teacher. If you’re a good “scholar,” you’ll go home with a yummy fried pie for a sweet end to your day. The next stop is Das Dutchman Essenhaus, home of Indiana’s largest restaurant and a peaceful escape in the country that offers a unique combination of dining, lodging and shopping opportunities. Manicured grounds invite a leisurely stroll or perhaps a carriage ride through a quaint covered bridge. Enjoy the beautiful Essenhaus grounds with a relaxing horse-drawn carriage ride around the immaculate grounds, play a round of miniature golf or go shopping in one of several Village Shops on the same facility grounds. Shop for quilts, baked goods, home décor, ladies apparel, Vera Bradley, jewelry and more. Later, enjoy faith-based entertainment suitable for all audiences in the quaint theatrical setting of Heritage Hall. Laugh and enjoy family-friendly productions with a message from the heart. 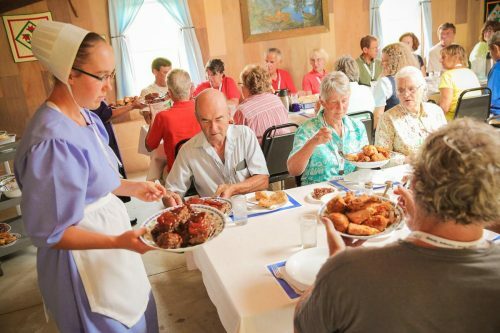 Groups can also dine on traditional family recipes passed down through generations in Indiana’s largest restaurant, which seats over 1,100 guests. Enjoy the all-you-can-eat buffet dinner that includes two soups, salad bar, four entrees, numerous sides and cobbler/pudding for dessert. Beverages are included with your meal. We love company in Northern Indiana and can hardly wait to introduce you to our local makers. From chimes to wooden baskets to noodles to quilts, this tour immerses you in the Amish culture, where life is natural, straightforward and easy to understand. Experience up-close-and-personal visits with the popcorn-grower, RV-builder and leatherworker to learn about their crafts. Welcome to a place of invention, creativity and resourcefulness. It’s a once-in-a-lifetime experience feasting on a traditional Amish wedding dinner in the charming setting of the Carriage House. Elaine and her son Seth explain what an Amish wedding day is like, complete with this special meal that would be traditionally served by the Amish to their wedding guests. Groups see an Amish bride’s wedding dress up close and hear the customary German wedding song sung at an Amish wedding. Travel scenic backroads and pass horse-drawn buggies, tidy farm homes and whitewashed barns. Learn about the fascinating lifestyle of the Amish as your knowledgeable guide tells all about the area and the history, traditions and customs of the Amish. You’ll stop at a variety of welcoming country stores and quaint shops as you load up your brown bag with goodies. Get to know local Amish entrepreneurs and see first-hand how they operate their unique enterprises. Hear the stories of friendly, hardworking people who use their special talents to create products and build businesses that serve the local community and beyond. Get a behind-the-scenes look at how Amish buggies are made. Visit a one-room Amish Schoolhouse. These stops are fun, authentic and appealing to every age and gender and are sure to be a hit with your group. This evening, enjoy some of the best Amish/Mennonite cooking around, outstanding entertainment, locally crafted furniture and much more at the Blue Gate in downtown Shipshewana. 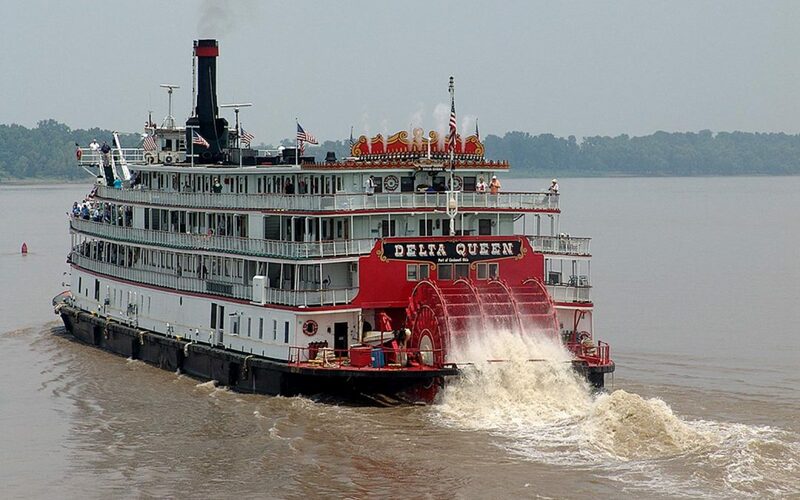 Featuring three retail stores, a restaurant, bakery, theatre, hotel, event center, catering, backroad Amish tours and a carriage business, this venue offers a variety of group-friendly services and options for your itinerary. Tonight you’ll sit down inside the 1200-seat Blue Gate Restaurant, enjoying buffet or family-style dining before heading upstairs for the original Blue Gate Productions musical productions. These original musicals based upon popular Christian books with Amish themes are brought to life in the 300-seat theatre. At the Menno-Hof Amish Mennonite Interpretive Center, learn the religious history and background of the Amish, Mennonite and Huterite people from their beginnings in Europe through their arrival in North America. Several interactive exhibits and displays depict “real life” experiences and answer many questions. On the Amish Acres Historic Farm Tour, learn about the heritage, culture and history of the “Plain People”. Afterwards, take a wagon ride to the one-room Amish School for an old-fashioned spelling bee. A documentary film about the Amish completes the experience. Spend time shopping and browsing their shops, fudgery and bakery.